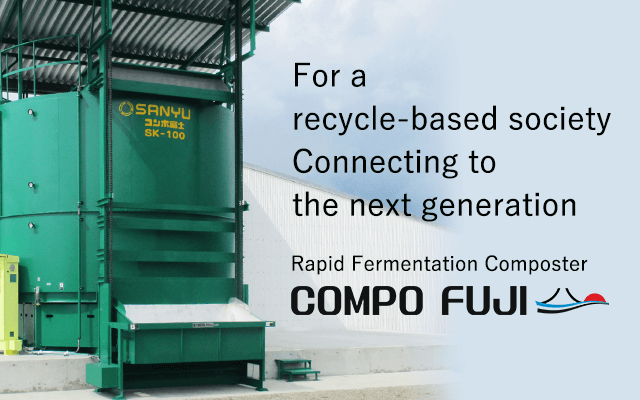 Compo Fuji SK series｜SANYUKIKI Co.,Ltd. 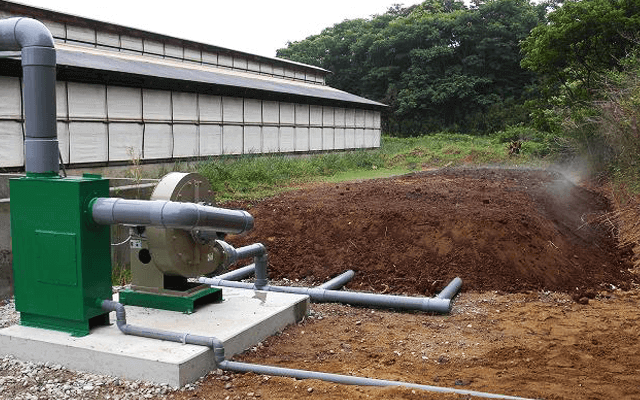 Due to growth of farming scale, large capacity manure treatment system with low operation cost is required. 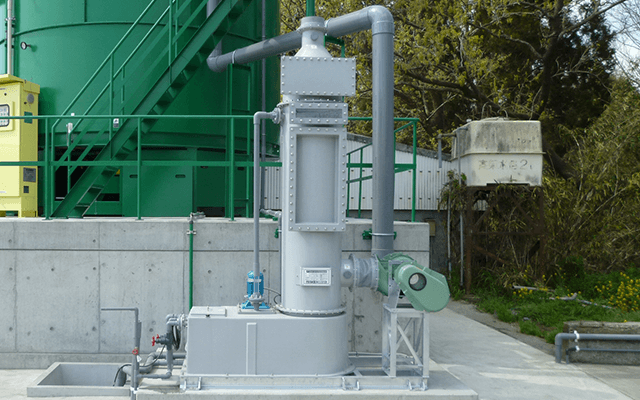 Compo Fuji SK series are developed to use our fermentation process technology accumulating for a long period and continuously improved by feedback from our customers. 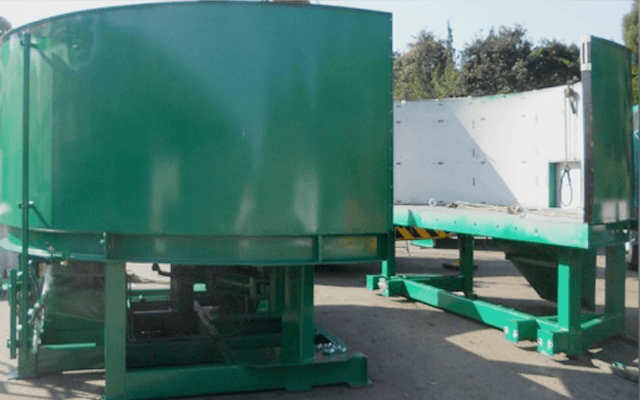 Compo Fuji SK series focus production quality of fertilizer, durability, operability and running cost and make large capacity treatment possible. 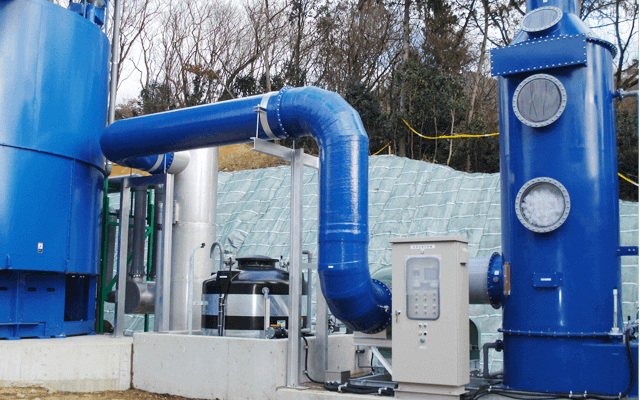 COMPO FUJI is equipped the special heat exchanger which utilizes heat of fermentation in organic wastes. Fermentation heat is used to exchange the heat with fresh air then warmed fresh air is delivered to inside of the tank. Only the exhaust gas is released. There is no usage of oil or gas to keep heat inside of tank so it’s ecofriendly system. The heat exchanger reduces 46,000 Kw of electricity per year. 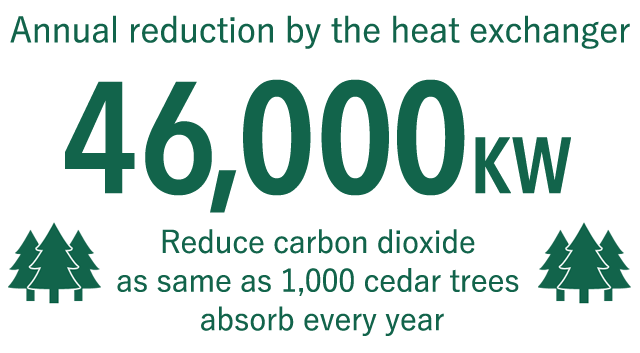 The total carbon dioxide emission is equal to absorb amount of 1000 cedar trees per year. Exhaust air go through the heat exchanger located on top of the tank. So it is easy to connect with deodorizing system. We can offer a right deodorizing system to meet your request. 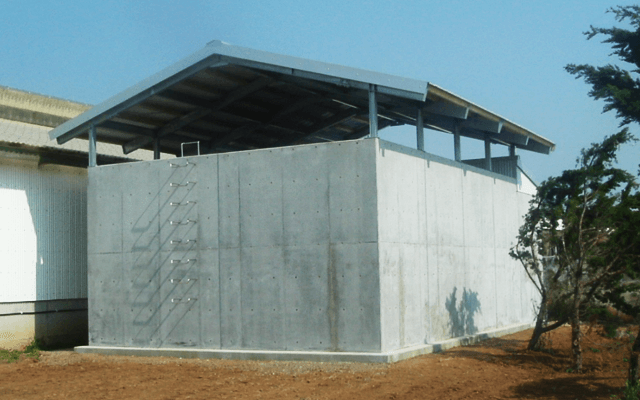 The 3 layer structure tank has strong durability. It keeps heat inside of tank and prevent influence of outside air temperature. The inner material of 3 layer is stainless steel (SUS304). Hydraulic drive for agitation is designed to increase durability. The small unit produces big power and effective overload protection and energy saving. 2 axis chain drive is equipped to bucket lifter for material input. 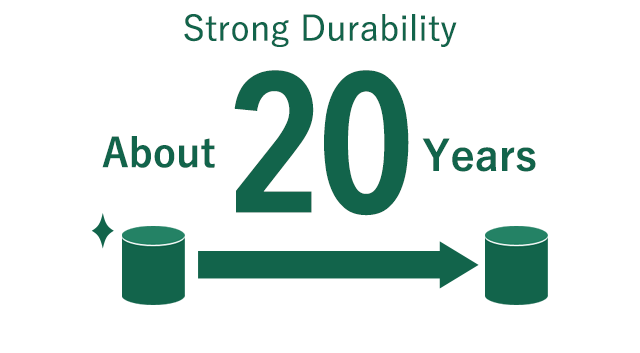 It improve security and durability. Total control system from input to output. Agitation load monitor & air blower load monitor indicate current load situation. It makes easy to control process and find out an abnormal situation immediately. Sequencer with self-diagnosis function indicate abnormal codes as soon as find out abnormal situation of the system. 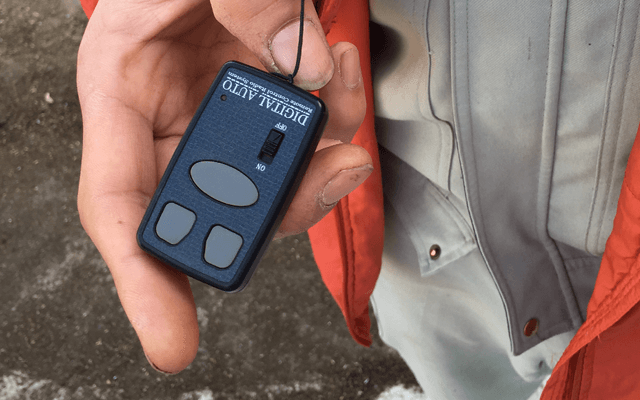 Remote control switch for input lifter makes operation much easier (optional). 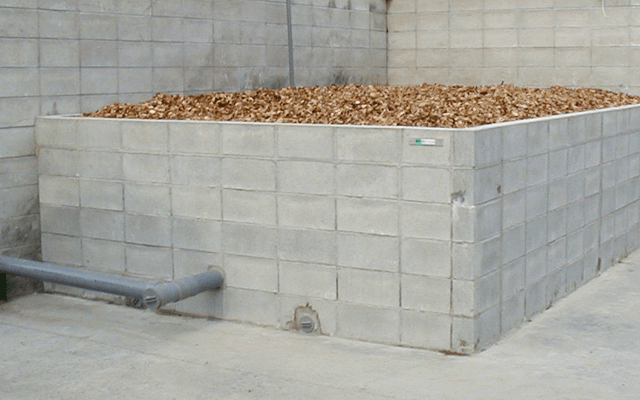 Vertical composting tank system doesn’t require large space to install.Tank is sealed so odor and noise doesn’t spread out.Big space is not necessary any more. Various tank sizes are available. We can provide right model and optional parts according to customer’s needs. COMPO FUJI is vertical tank system. 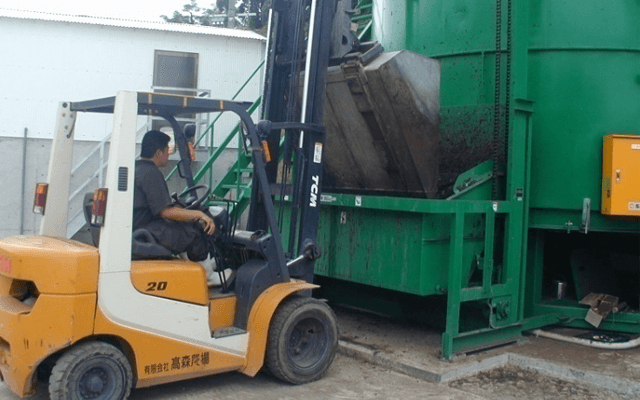 ①Bucket lifter lift up organic wastes and ②put them into input port automatically. 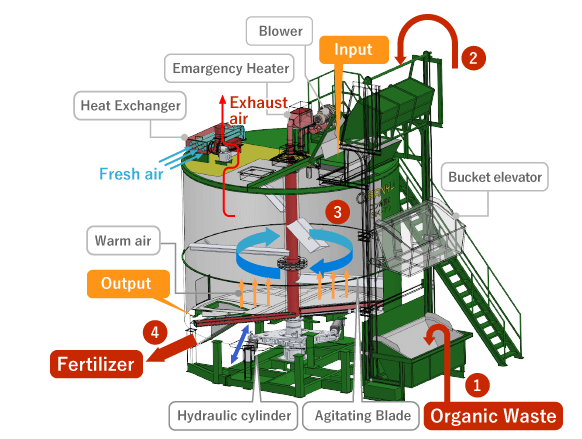 ③Organic wastes are mixed by Agitation blades. 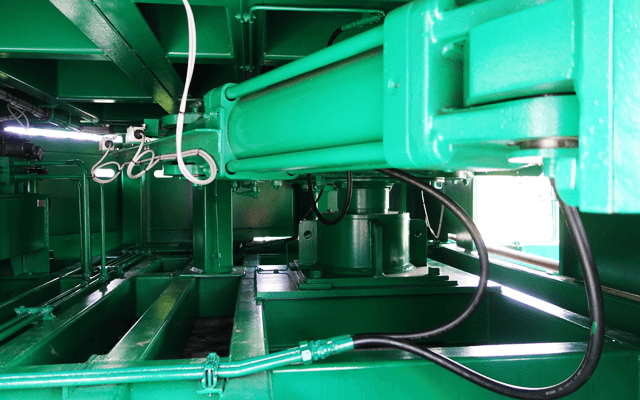 Special designed hydraulic drive system rotate shaft with Agitation blades. The system is top in bottom out system. 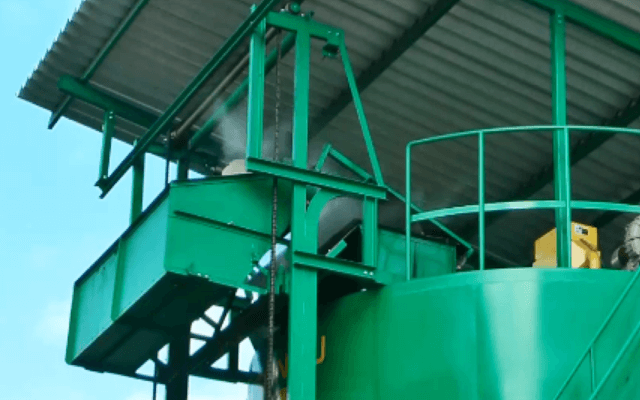 ④Produced fertilizer is discharged from bottom door after process. 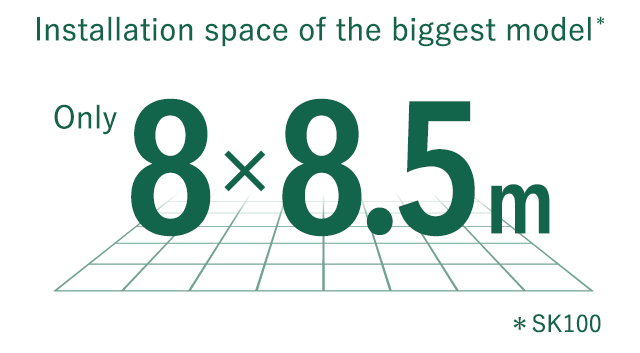 Required installation space is small. Less operation cost by using gravitation. 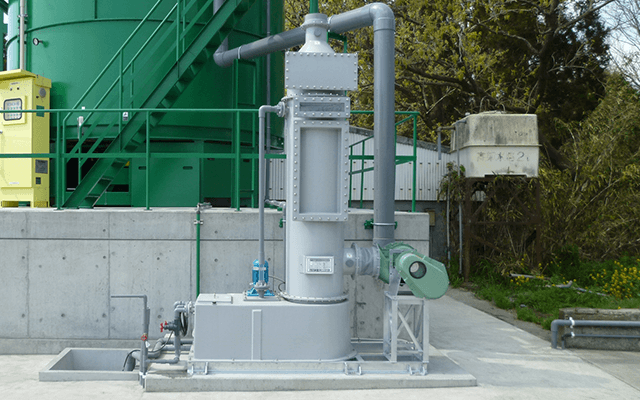 The driving unit is separated from organic wastes so it doesn’t affect by corrosive substance and maintenance is easy. fresh air heated up by heat exchanger is supplied to inside of tank and speed up fermentation. It is easy to manage odor because there is only one outlet of exhaust gas. COMPO FUJI is easy to operate. 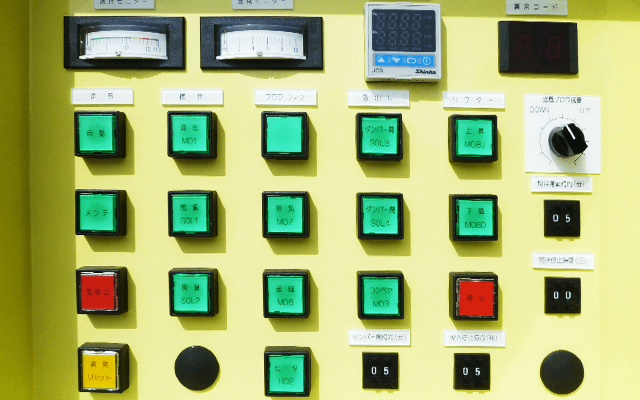 The centralized control panel controls from input to output. 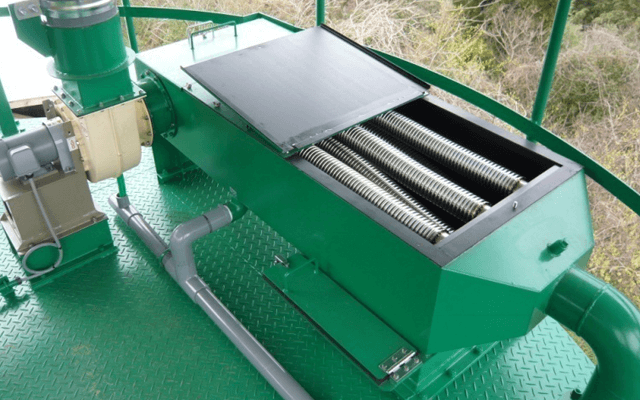 Compo Fuji is a composting system in a sealed container, so odor control is easier than other systems. We propose odor management according to customer’s request. Remove odorous gas by water showering. 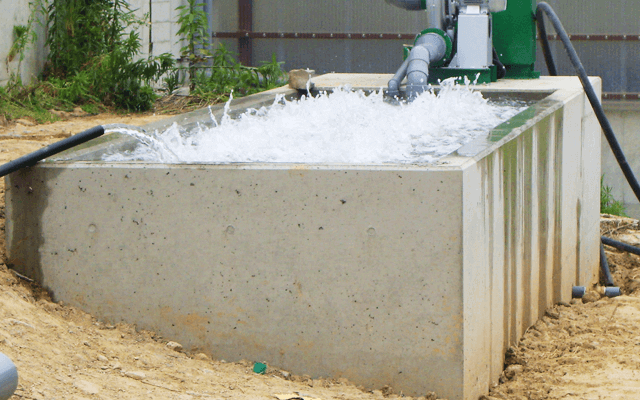 There is limits of odorous gas to solve into certain amount of water. Dissolve odor gases in water. There is a limits in the amount of odor components soluble in a certain amount of water. Adsorb and remove odor components with activated carbon, silica gel, activated clay, sawdust, corrosive substances, etc. We make suggestions on total line from interview to after-sales. We will respond quickly to customer’s needs, such as remodeling construction and maintenance of facilities. Copyright(C) SANYUKIKI Co., Ltd. All Rights Reserved.